You don’t have to be German to love traditional German Christmas Markets. The twinkling lights, merry music, hot mulled wine and tidy wooden vendor stalls are a favorite with everyone. 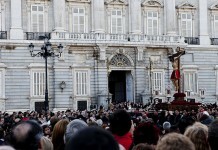 In fact, many visitors travel to Germany just for the Christmas markets alone. It’s usually cold at Christmastime in Germany, but drinking hot mulled wine can help keep you warm. With its cinnamon, cloves and other spices, Glühwein just smells like Christmas. 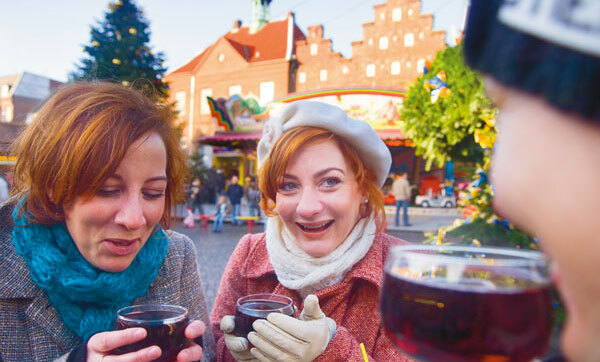 Every Christmas market sells mulled wine and every German region has its own variation. 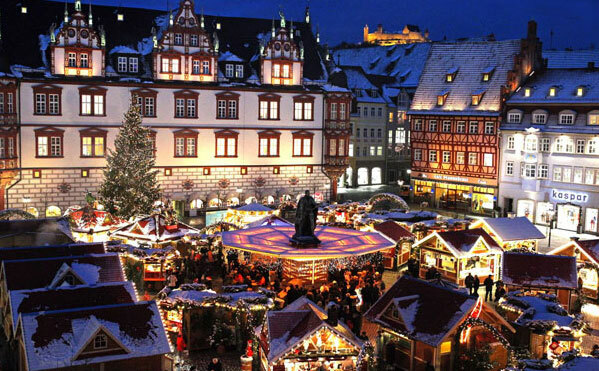 Frankfurt, for instance, is famous for apple Glühwein, which is mulled wine made with hard apple cider. Yummy! 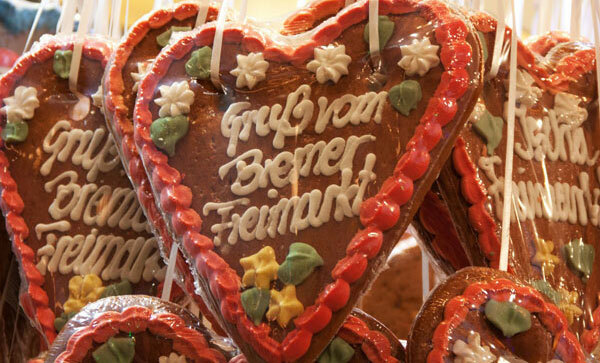 While we’re talking of delicious traditions, we have to mention Lebuchen, or gingerbread, as it’s called in English. One favorite type of Lebkuchen is Aachener Printen, which originated in the city of Aachen. The Aachener Printen und Schokoladenfabrik Henry Lambertz make many varieties of Lebkuchen, including hard, soft, with herbs, with chocolate or nuts. Founded in 1688, the company is the largest German producer of gingerbread cookies and also exports worldwide. The Christmas markets in Aachen are famous for their Lebkuchen, but you’ll find Lebkuchen in every Christmas market in Germany. Walk through any German Christmas market, and you’ll see many different kinds of Advent wreaths or calendars. 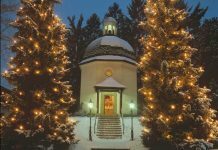 Advent is the four week period before Christmas, and it’s a huge part of Christmas celebrations in Germany. A traditional Advent calendar is made out of a wreath of fir tree branches with 24 decorated boxes or bags hanging from it. The boxes or bags represent each day before Christmas, and each one has a little present inside. Another part of Advent tradition is the Adventskranz – the Advent wreath. On each Sunday before Christmas, a new candle of the Adventskranz is lit. Stollen are delicious German Christmas cake rolls, and the town of Dresden is most famous for them. The Striezelmarkt in Dresden is one of the best places to buy a traditional stollen. 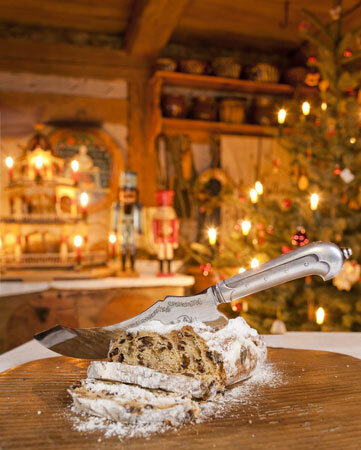 Stollen were first documented in 1474, and this festive fruit cake has been a Christmas favorite ever since then. These peculiar little Christmas dolls are made of dried prunes and walnuts. 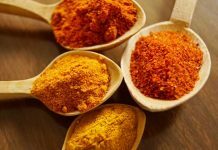 This tradition goes back to the 17th century as a way of making gifts from the local harvest. The Zwetschgenmann (prune people) are a gesture of good will, and are said to bring you good luck. 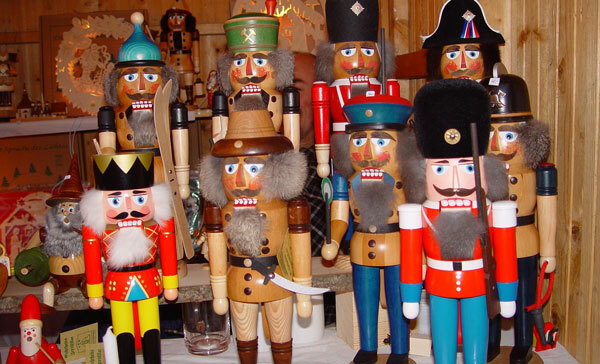 Wooden carved ornaments are popular Christmas items, and none are more beloved than nutcracker soldiers. These Christmas icons were invented in the Ore Mountains in Saxony. 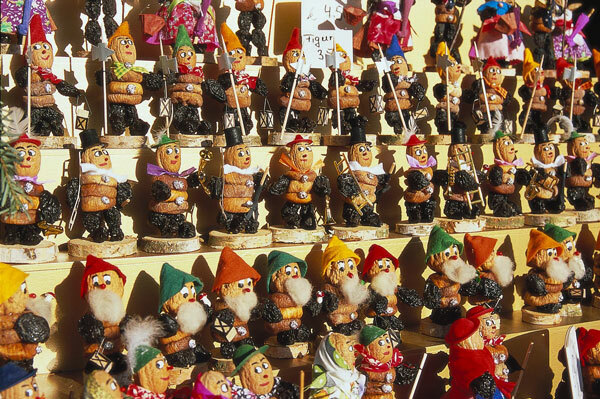 These days, the Striezelmarkt in Dresden and the Christmas market in Nurnberg are the best-known Christmas markets for wooden ornaments and nutcrackers. 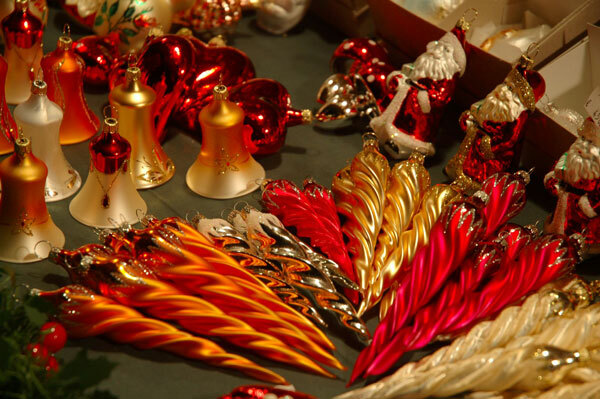 Most German Christmas trees are filled with glass ornaments. The town of Lauscha is said to be the birthplace of Christmas tree decorations. 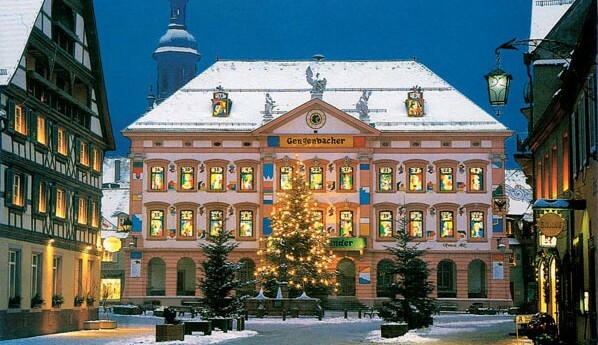 Today, the Christmas markets in the state of Thuringia are best known for selling glass tree decorations.